Two by Two has created a new identity for accountancy group Spofforths. The World Bank has launched the identity of its Global Road Safety Partnership in Geneva. Llantrisant consultancy Amryliw has been appointed to design promotional literature for Cardiff University’s Open Day 2000. 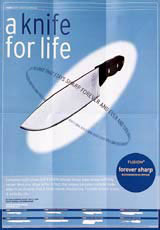 Richardson Sheffield is relaunching its Fusion knife range having redesigned the products. A new identity, in-store literature and packaging has been completed by Elmwood.